DIY Tiled Bar – Free Plans and a Giveaway! The weather is FINALLY cooling off here and we are so excited to spend the Fall outside on our back patio! We like to spend a lot of family time and entertain during football season and my hubby and I have been talking about how fun it would be to have a little bar area out back! So, I designed and built this DIY Tiled Bar and I LOVE it! 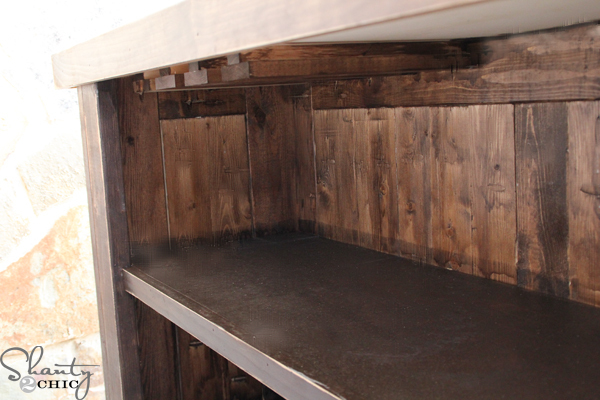 It has a cool stem wear addition under the top and shelves for storage! I also tiled the top! CLICK HERE FOR THE FREE PLANS AND SUPPLY LIST!!! What is the estimated cost for this whole bar? I am currently about most of the way thru this project. It took a little time to figure out exactly what goes where since the plans are not very detailed. I am not at the tile part. excited to see the finished project. Can someone please help me; the plans say to use a pocket hole screw to join the front pieces together; I am just starting to use one, but can anyone explain in a little more detail how to assemble the pieces side by side? I have never done a pocket hole that spans more than 3″ wide? I have a question. How did you attach the backer board to the plywood? Did you use thinset or screws or both? Hi Rob, I am on this very part of the build…how did you attached the backer board? I haven’t built this yet, but Shanty2Chic just answered my question. Sorry for the delay! Screws and thinset! Thanks! I’m assuming the screws should be about 3/4″ long so they don’t poke through the bottom of the plywood? As I work on the farmhouse table found elsewhere on your site, I look at this and think, “I can so do this next year!”. Thank you for the inspiration. Did I miss the announcement of who won this combo kit giveaway? Awesome! I have been doing more and more projects that would be a lot easier with power tools! !